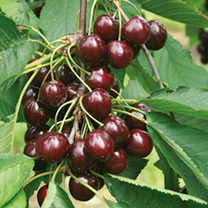 An outstanding cherry bearing a heavy crop of very large dark red, high quality fruit 2-3 weeks later than Summer Sun. Exquisitely flavoured and very juicy! Resistant to cracking. Pollination group 5. Given that cherries are such a well loved fruit, it's surprising that they are not more widely grown in our gardens. Grown on Colt rootstock, giving a very productive tree with good fruit size, but compact growth so it can be grown in a small space, either free-standing or trained against a wall or fence. The combination of modern, self fertile varieties, Colt and Gisela 5 rootstock on which our cherries are grown means that garden cherry growing can be a very rewarding experience with regular heavy crops being very much the norm.